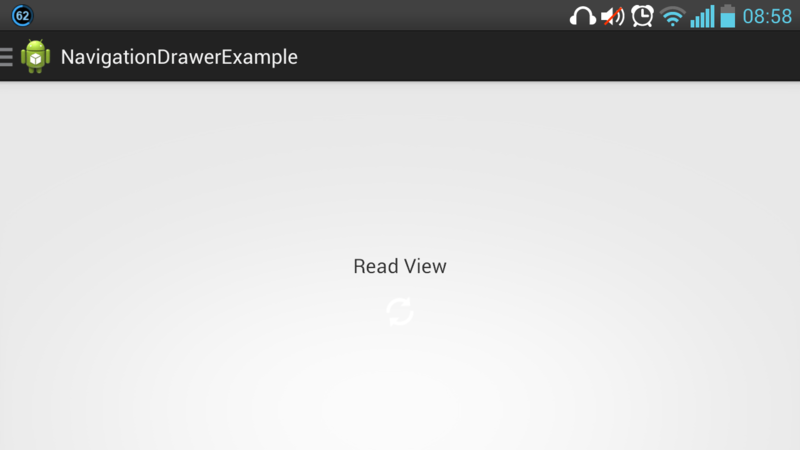 Android Navigation drawer is now a standard when creating an Android app. It gives a better user experience since the user can easily access more app functionality – on a small screen smartphone. Personally, it is really fun to use since I just have to swipe a finger to use or access a view. 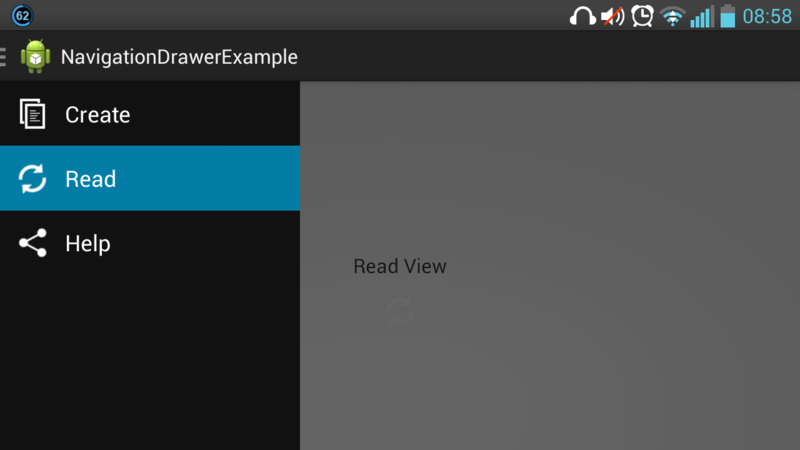 This post is a step by step guide on how to create a navigation drawer for your Android app. 1. Change activity_main.xml to navigation drawer layout. 4. put inside MainActivity.java oncreate – initialize three properties. 15. try to run – swipe your finger left to right – it works! As of this stage, the app icon is useless to the nav drawer. It cannot trigger the nav drawer. This is what will be our next steps. This is really needed to make app icon a toggle of nav drawer. This is really needed for changing titles. 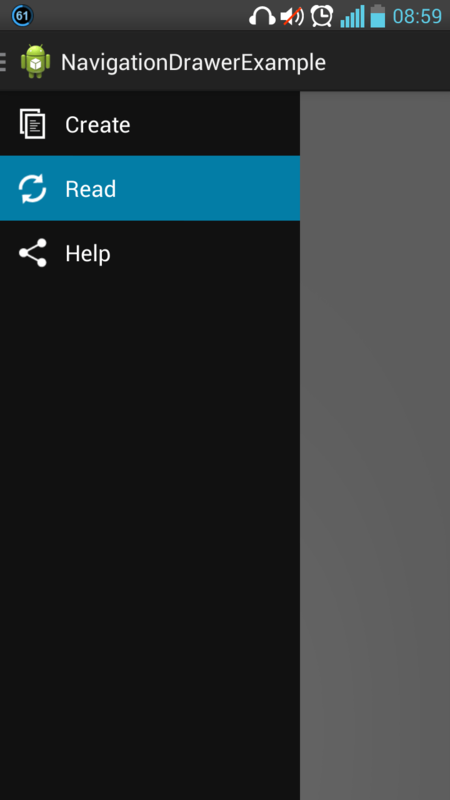 Android Navigation Drawer only works for Honeycomb and Up. To make it work with pre-honeycome devices, you should use the Android support library. Download it first using your SDK manager and then follow the step by step guide here. This link might also help you. I found the following video helpful too. How to remove the launcher Icon on the action bar in your code ???? Hey Tomesh, do you mean you don’t want to show any launcher icon in your app? How about replacing it with a blank png file? Hi, I’m having error in the DrawerItemClickListener.java with the getFragmentManager() and getActionBar(). How to fix those? Hey Joe, would you give us the logcat of that error? We cannot fix it unless we know what exactly is the issue.. Thanks! Its an error that doesnt allow the code to compile, not a run time error. It cant seem to resolve getFragmentManager(), mDrawerList, getActionBar() and mDrawerLayout. And alt-Enter doent help too. I think something is missing in the code maybe. Hey @krishna, thanks for sharing your thoughts, you’re awesome too because of that! Is there any tutorial on how to make the fragments within a navigation drawer scrollable? I attempted to add a ScrollView to the XML file, but it caused the app to crash unexpectedly. Hey @anthonyolsen:disqus , I think if you have several items on the navigation, it will scroll automatically, have you tried it? Else, thanks for this blog post suggestion! Hi there. I have been manipulating a little bit with this awsome code, trying to make the listview expandable, but without success. Do you have any suggestions? Hi @RabbiHardar:disqus, glad you found this code awesome! I haven’t tried it with expandable listview, but thanks for this possible blog post suggestion! Hi, The landing page is blank. How do we make it default to create fragment ? Hello @valentynchub:disqus, thanks for letting me know! Sorry for the inconvenience. It’s fixed now. Step 12 needs to added to your MainActivity.java file and not a separate class. Make sure to copy to import all the items. Here is the full list. how can i create navigation drawer while there are listview in activity_main layout? Do not use ActionBar , instead use Toolbar . It is a new powerful class added recently in the support library version set which allows you to deal with animated icons . Hello @Chaker, thanks for the tip! Would you give us a link or resource related to it? If I want to use the same fragment for multiple options in the drawer but change the textview depending on what item i selected, how do I do that? Do you mean I can replace “fragment = new CreateFragment();” with “text.SetText=(“test”)” in the switch statement? If I add a click listener at the onCreateView() how will I get the position for the switch statement? There is an error that doesnt allow the code to compile in DrawerItemClickListener.java. It cant seem to resolve getFragmentManager(), mDrawerList, getActionBar() and mDrawerLayout. And alt-Enter doent help too. I think something is missing in the code maybe. how can i assign a button action in the first fragment? I did everything step by step, i have no error at compile time, but the onItemClick-Event is never fired. What could have gone wrong here? Hello dashhund, we’re currently fixing things for our source code download, thanks for you patience! Hi ! Thx for your tuto. but i need help on one thing ! I don’t understant the line: fragment = new ReadFragment(). What is this method ? it’s about fragment_read.xml ? How the link is do ? Sorry, but I dont see it. What line number is it? I’m using Ctrl-F and nothing comes up. Thanks!! Hello @ninjaka baap, I believe I published all the codes above, which part of the code is missing for you? I have followed the same code but when i try to add new fragment the app crashes,can you please tell the possible cause? Hello @ashish, would you paste the logcat error? Hi, I want to report that the registration e-mail isn’t working anymore; I tried to register with 2 different e-mails but with no success. I want also to highlight some wrong parts in your code (maybe they aren’t wrong, but with your code it doesn’t work). Whoever gets a NullPointerException on getActionBar(), change getActionBar() to getSupportActionBar() (in each call of the method). BTW, I believe it would be useful if you fix the registration mail, so users can download the entire code. Thanks for this nice tutorial! Hello @disqus_MKOHlmxstk:disqus, did you check your spam folder? Thanks for reporting about it and your tips! I’ll work on updating the registration email soon. I’ve just checked but unfortunately the e-mail wasn’t in the spam folder. Anyway, I’m glad to hear that! Keep on your good work. Hi, I followed all the steps mentioned by you here , but still getting compilation issues. Hello @Amar, would you be more specific and give us the compilation error messages? Thanks a lot! We are working to give a download link. Hei guys, anyone who gets error in DrawerItemClickListener.java , it’s not a class, it should be a method of MainActivity.java , just try to match the codes after following this tutorial. How to add material design in this code? how can implement wcf service in android apps ..
get it what i find from last 2 days… easy,nice and clean.. great work..
Hello @disqus_QCIgxgMAop:disqus, thanks for your kind words. Glad it worked for you! Very nice tutorial for android beginners like me. I tried the above code with my application. Here I am facing a problem. For me only title is changing after selecting menu item from navigation drawer, View is not replacing. Thanks for the tutorial but i have one query , ho to change the drawer color from black to some other thanks in advance. How to change selected item background color ?? hey my friend, first of all tnx for this manual its great. How can we apply same navigation drawer on all activities? hi, its a good tutorials. I try step by step carefully, When I try on the break, Its run well, but when I click the “Create” menu, it make force close. I think it should be go to createfragment the view fragment-create. may be someone can give me suggest what to do? Error:Execution failed for task ‘:app:compileDebugJavaWithJavac’. > Compilation failed; see the compiler error output for details. I have downloaded this code and made a project of my own following the step by step instructions. Im using Eclipse Juno. In the MainActivity.java the line import android.support.v4.app.ActionBarDrawerToggle; shows deprecated. If i change the import to v7 then the new ActionBarToggle line gives an error.